Thinking of flying to Hobart? I’m afraid I can’t tell you much about the inside of Hobart airport. I’ve only seen it from the outside. It’s not that big though.. I can’t imagine anyone getting lost for long. Once you’ve found your way out to either a cab or your hire car (assuming you don’t have a hotel pickup waiting), you’ll notice the semi-agricultural / semi-industrial land around Hobart airport shortly turns into suburban housing. Passing by suburbs Rosny Park, Rose Bay and Bellerive, you’ll get your first good look (from the ground at least) of Mt Wellington which dominates the skyline of the city. As you crest the top of the Tasman bridge you’ll see Queens Domain and the Royal Tasmanian Botanical Gardens directly in front of you. They are definitely worth a visit if the weather’s reasonable. For those of you who may be hoping to see Pete’s Patch while you’re there, I hate to disappoint you, but you’re too late. The Royal Botanic Gardens are developing The Tasmanian Community Food Garden there instead. Rest assured, it has Pete’s tick of approval. See here for more. Head up to the top of Mt Wellington to get a bird’s eye view of the city – if the weather’s clear and the road’s not closed due to ice. The only time I’ve been up there it was rather cold and the top was shrouded in cloud (well, it was in July). Make sure you have warm clothes on, or at least to hand, when you go – whatever time of the year. When it’s not cloud covered, it’s often pretty blowy (very windy)! The good news is that there’s a sheltered observation deck as well as public toilets on top. You will also be able to appreciate the columns of dolorite rock which form the mountain. 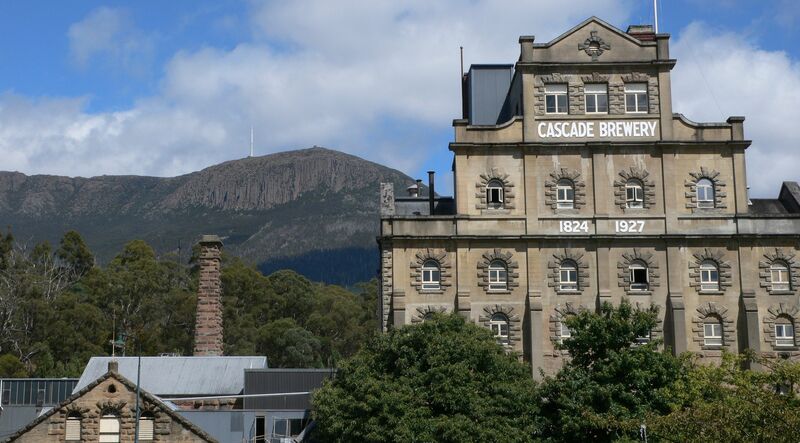 There’s no cafe on top, but the Cascade Brewery and Visitor Centre is just off the road leading up to the mountain. Even if you don’t choose to stop for a tour of the factory, the visitors shop has a nice cafe, lovely gardens and sells (in addition to beer) Cascade cordial, juices, T-shirts, stuffed toys, key rings etc. 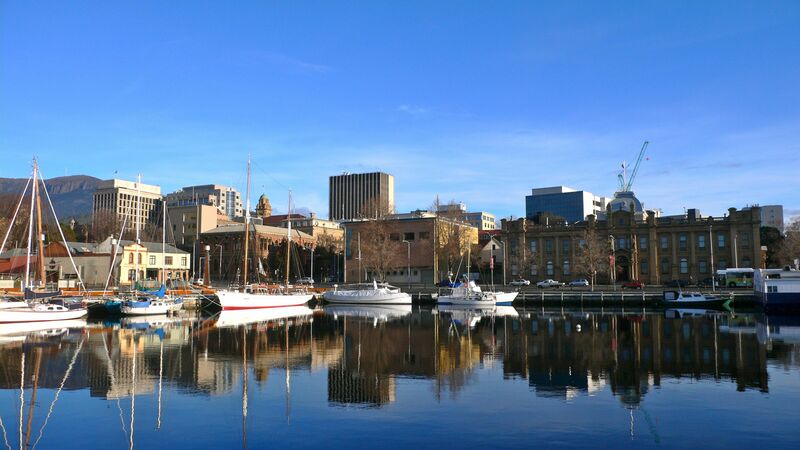 Head to Salamanca Place down near Constitution Dock and check out the fascinating boutiques and art galleries it’s renown for (the CBD seems to just have the same chain stores you’ll find in other Australian cities and towns). There is so much to see and appreciate. I’d love to buy lots of it but I haven’t won lotto yet, so I shall stick to just looking and admiring. Every Saturday morning the Salamanca Markets are on. Walk there if you can, to save yourselves the hassle of finding and paying for a car park. The stalls sell various handcrafted wooden things (Tassie markets native wood products like nowhere else I’ve seen – and there are some truly beautiful items for sale), fresh produce, books, jewellery, clothing, plants… and if you don’t want to eat while you walk, you can stop for a decent breakfast (or lunch) at either Salamanca Square or maybe even the Jackman & McRoss bakery (57-59 Hampden Rd, Battery Point) and see Arthur’s Circus on the way there or back. A suggestion if you wish to explore Hobart is to stop by a bookshop and pick yourself up a copy of “A Walk In Old Hobart” by Charles Wooley and Michael Tatlow. 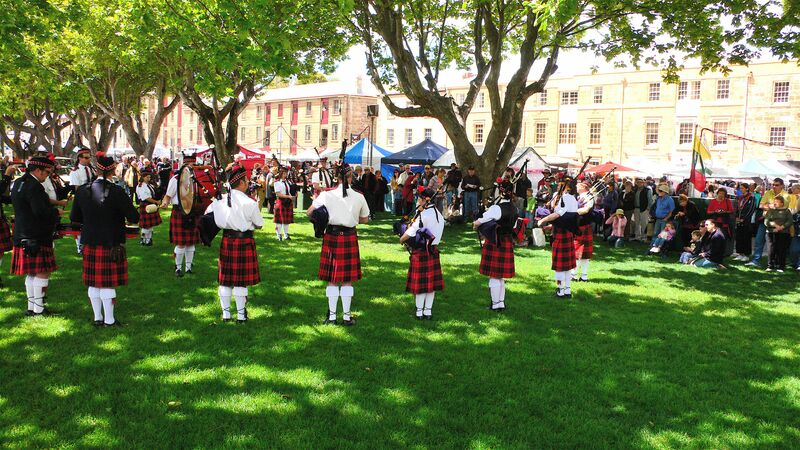 There is so much history to discover around Hobart and Battery Point. The walking tour described in their book should take about 2hrs. I’ve done a bit of it with Stephen (he’d already read the book) and it’s fascinating stuff. They have also written “A Walk in Old Launceston” and “A Tour of Old Tasmania: Your official guide and ripper true tales of the past”. MONA, the Museum of Old and New Art is the new(ish) and infamous art gallery. We haven’t been yet. At a guess, I’d say it’s about a 20-30min drive north of Hobart, on the same side of the Derwent. I think it’s where Moorilla Museum of Antiquities is/was. The guy who owns Moorilla is a bit of an odd chap, to judge by the art on his wine labels. The wine can be very good, but who knows what goes on in some people’s heads? Here’s a blog post by Julie who took her family (young and old) for a visit there. The quaint old town of Richmond is roughly half an hours drive from Hobart on the north side of the river. Famous for its bridge, it’s possibly more of a place of interest on the way to something rather than being much of a destination in and of itself I think. Maybe I missed something. Then, of course, there’s Port Arthur, which is a full day trip. We haven’t been, but it is on our To-Do list. 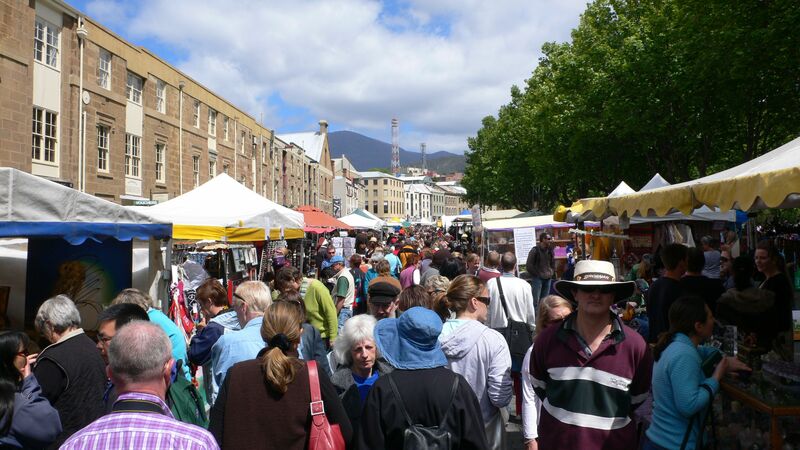 If you DO go over Christmas/New Year, you’ll be able to go to the Taste Festival (aka Taste of Tasmania) which I hear is immensely popular. It’s also on our To Do list at some point! Part of the Pure Tasmania group, the HJH is located on the northern side of Sullivan’s Cove, and just a 10min walk from Salamanca place, we have stayed here twice, and both times were very nice. The first time we stayed in room 224 which is right at the end of the first floor, and looks out at the docks; the next time we asked for an atrium view (facing the other way) and we were given room 225! The rooms are comfortable, as are the beds. The bathrooms have under floor heating which is pure bliss in winter, and the lighting in the bathroom is very effective yet discreet and has so captivated Stephen that when we finally renovate, he’d like to do something similar in our bathroom! The artwork in the hotel is all for sale (I believe) but I wasn’t tempted by any of it. There are other shops at street level selling art works (some of the wood work is stunning) and clothes, and there’s a providor too, although I think of it more as a sweet shop that sells a couple of non-sugary things. Because the hotel runs through the insides of a few old buildings on the wharf, the floor level changes – be prepared to pick up your suitcase for a couple of steps. Part of the old walls and the ceiling is exposed showing interesting textures and colours. Combined with funky lighting, this is most definitely not a run of the mill hotel. Parking in the area can be tricky, so we have always opted for valet parking – they have a secure warehouse somewhere. The staff are professional and helpful. The place is clean and tidy. They have a cafe and restaurant at the Hotel, but we’ve never eaten there. Lots of people seem to though, and the courtyard has a relaxed atmosphere. Literally just around the corner from Salamanca Place, we stayed in a Harbour View room – and the view was magnificent. The room was large and very comfortable. The bathroom was not as new and funky as the one at HJH, but it certainly did the job. The Lenna has it’s own carpark for guests and although it’s in the open, it was good to have the car easily accessible when we needed it, without bothering anyone. The accommodation block is separate to the historic building that was the original home of merchant and ship owner, Alexander McGregor. That building is very luxurious, and now accommodates the restaurant and several function rooms. If you go to the top of the building, there’s a squat tower that was built so that McGregor could watch (his) ships coming and going – it’s worth the climb! Wonderful view! I read a few online reviews that were less than complimentary about the Lenna – people were sometimes disappointed that they were in a besser block appendage to the main house, someone complained that it was drafty, someone complained they couldn’t open the windows… Yes, the building is made of besser blocks, but they’ve tried to make it fit with the original house by putting a few embellishments on it, and they’re also letting ivy grow on it to try to disguise it a bit. Personally I don’t think the ivy is necessary, but that’s my opinion. I thought the rooms were very comfy – I wasn’t stuffy and didn’t notice any drafts. One thing I liked most about the accommodation block was that it’s actually a U-shaped building – there’s well through the middle of the building so you get a view back to the original house from the inner walkway on each level. At the bottom of the well is a garden that you can look down on. The gardens around the property are beautiful, and the hotel is right next door to the lovely Princes Park should you feel like a short stroll. We enjoyed one breakfast at their restaurant, which was good. They give guests the option of a cooked meal or continental/buffet breakfast. I certainly wouldn’t hesitate in recommending a stay at the Lenna. It’s also a little cheaper than staying at than the HJH. We haven’t stayed here, but have considered it a few times. The main drawback is that it’s a little way out of town. Looks fabulous and luxurious… and has prices to match. I have been to two very fine restaurants in Hobart – places so good I could not possibly imagine what they could do better. NOTE: Bookings essential. Make sure you catch a cab there. The restaurant is in a house; open the gate, go up the path and knock on the door – you’ll be expected. The rooms are small and intimate – our room was roughly 5m x 5m and had only two tables in it – ours and one for another couple. There are 3(?) other rooms, but you wouldn’t know how many people were dining at any given time when seated at your table. Our waiter was absolutely superb. Unobtrusive. Exceedingly polite. Knowledgeable. Stephen likes to ask the waiter or sommelier to recommend a local wine to go with our food – to us, the trademark of a good sommelier is one who not only picks a good wine, and can describe it to you, but who can also explain why it will compliment your meal. Top marks all round here! The Grey Sands wine we had was beautiful – I think it was a Merlot? It was one of Gray Sands top wines at any rate. There’s a new-ish placed called Ethos, on Elisabeth Street in the city, which seems to be going great guns that we’re looking forward to frequenting next time we’re in the neighbourhood. The owners of Ethos used to run a fabulous restaurant called Piccalilly at Battery Point. Even though Ethos represents a change of style from degustation to tapas… well I can’t imagine that such talented people could suddenly lose their ability to make culinary magic. Check out their Facebook page Ethos Eat Drink to see what they’re up to. Other restaurants that I haven’t been to, but I hear are good include Montys on Montpelier (Battery Point) and Smolt in Salamanca Square.